On this small group tour, you will get to know the fascinating desert country in all its facets. Explore the picturesque dune landscapes of the Kalahari and the extraordinary quiver tree forest, the impressive Fish River Canyon and the vast sea of dunes of the Namib Desert. You experience endless horizons, fascinating landscapes and bizarre rock formations in the Erongo Mountains as well as the Damaraland. 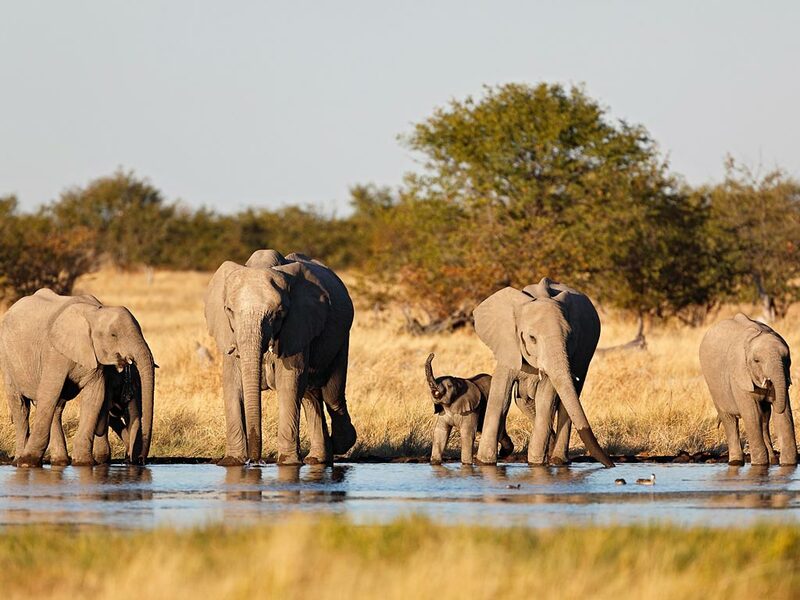 In Etosha National Park, we focus on wildlife sightings while panoramic views await you at the Waterberg Plateau. On top of it all, the cities of Windhoek, Lüderitz, and Swakopmund invite you for days of discovery. We not only show you the highlights of Namibia. We take you to hidden gems in nature, show you our favourite places and share our passion for Namibia. Upon arrival at Windhoek International Airport, your transfer driver welcomes you to Namibia and takes you to your guesthouse. Here, you can relax and slowly arrive in the country where you will spend the next three weeks. In the afternoon, you meet your guide and together go on a city tour around Windhoek: visit the Christ Church, the parliament known as ink palace and Independence Avenue. End the day with dinner at Joe’s Beerhouse (own expense) together with your fellow travellers. You spend the night at Vondelhof Guesthouse. After breakfast, you head out to explore Namibia. Leaving Windhoek to the south, you drive to the Kalahari. This crossing-border desert forms the largest continuous sand surface on earth. The dunes of the Kalahari are covered in different vegetation such as grass, bushes and leafy trees. Along the way, you stop at the small village of Hoachanas to see one of the oldest churches in Namibia. Here live the people of the Nama, once nomadic cattle breeders in the south-west of Africa. It is now time to drive to your accommodation for the night, beautifully situated amongst the red dunes. Enjoy the play of colours at sunset across the Kalahari. You overnight at Bagatelle Kalahari Game Ranch. In the morning, you can join a Bushmen walk (optional). Afterwards, you continue to Keetmanshoop. Take a rest at the guesthouse, before you visit the Mesosaurus Fossil Site as well as the Quiver Tree Dolerite Park in the afternoon. The more than 3,000 prehistoric quiver trees with their golden bark and yellow blossoms shimmer in the setting sun. For dinner, visit a restaurant in Keetmanshoop (own expense). You overnight at Quiver Inn Guesthouse. After breakfast, you drive to Naute Dam and stop at Naute Kristall Distillery for a light lunch snack. Here, you learn about the distillery and can join a gin or brandy tasting (optional). In the early afternoon, you make your way to Fish River Canyon – at 160 kilometres long and 27 kilometres wide, it is the second largest canyon in the world. 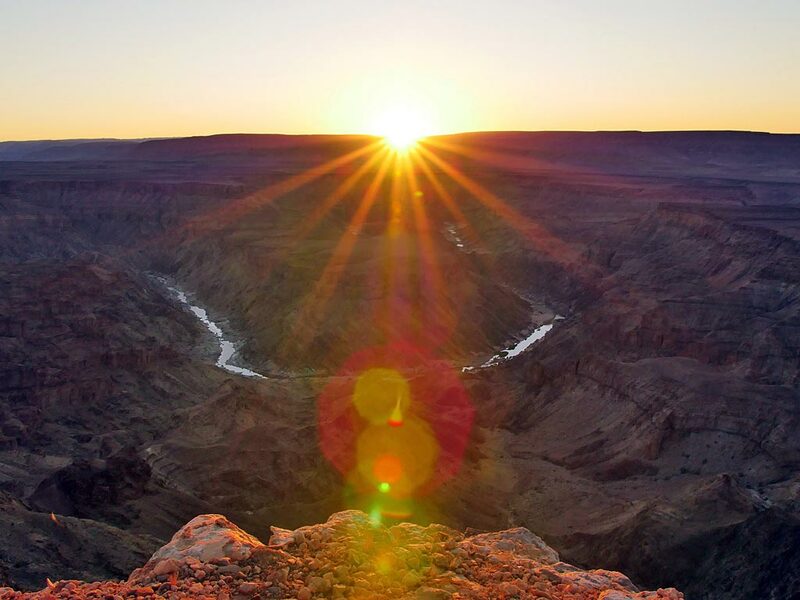 Your home for the night is Fish River Lodge, nestled up to the rim of the Canyon. Be enchanted by the magnificent views and enjoy this impressive natural scenery. Enjoy once more the unique views across the canyon, before you make your way on rough roads towards Aus. With a little luck, you may be able to spot wild horses at Garub in the afternoon – until this day, no one is certain about their origin. You spend the next two nights at Desert Horse Inn on the farm Klein Aus Vista. On a day trip, learn about the colonial history and visit the coastal town of Lüderitz with its monolithic church and Goerke House. Another excursion takes you to Kolmanskop, former home and place of work to about 400 people during the diamond rush. Today, it is an open-air museum with a mystique flair, slowly being covered by desert sand. Today takes you across the picturesque region of the Tiras Mountains along the road D707, known as one of the most beautiful roads in the country. The fascinating desert landscapes invite for multiple photo stops. On your way towards the NamibRand Nature Reserve, you take a quick detour to Duwisib Castle. The castle built of red sandstone and formerly owned by a German colonialist is now a museum and national monument. Find out about the curious story of this desert castle! In the course of the afternoon, you will reach the Greenfire Desert Lodge. Enjoy the peaceful and secluded ambience. Your journey today takes you north to Sesriem where you will explore the Sesriem Canyon in the Namib Naukluft Park. This roughly one kilometre long and 30-metre wide canyon was formed millions of years ago by the Tsauchab River. During the dry season, you can take a walk through the canyon, watching the sunlight reflect between the steep canyon walls. Later on, you leave the Namib Naukluft Park to end the day at the Elegant Desert Lodge. Look forward to visiting the Namib, the oldest desert in the world. It’s an early start to the day, returning to the Namib Naukluft Park, where you can hike up one of the great dunes. The somewhat tough ascend on soft sand is rewarded with magnificent views across a sea of dunes. 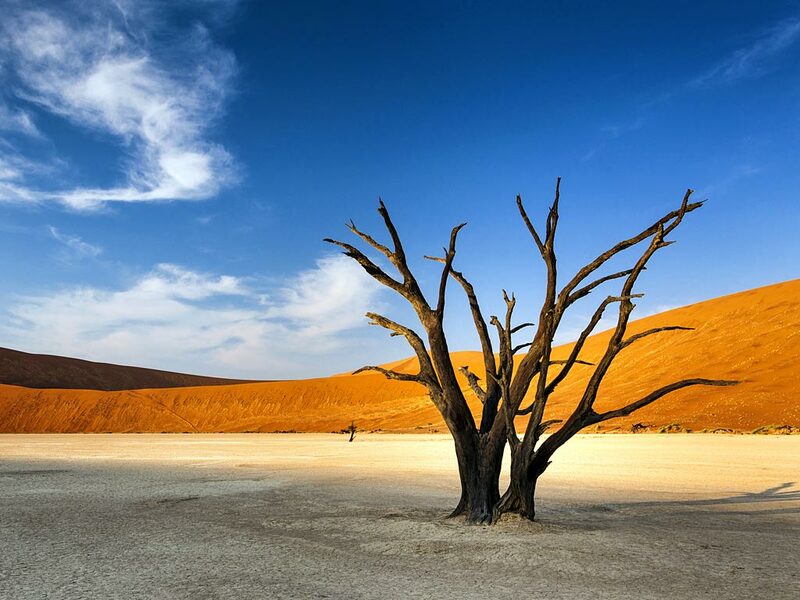 You now visit Sossusvlei, a clay pan circled by dunes as well as the Dead Vlei. The contrast between the white clay ground, dark camel thorn trees, rust-red dunes, and the clear blue sky is impressive. Welcome to photographers’ paradise. You head north to the unique Namib Dune Star Camp – the perfect place to take a break from the rest of the world. At night move your star bed out onto the terrace and spend the night under the vast starry night sky of Namibia. Today takes you north-west across the rugged landscapes of the Gaub Pass and Kuiseb Pass. Take a turn off the main road and onto a lesser frequented road across the remote northern part of the Namib Naukluft Park. You reach the Welwitschia Drive, lined by ancient plants of the same name. Take in the bizarre looking Moon Landscape with its rugged rocks, before you stop for a break at the Goanikontes Oasis at the Swakop River. 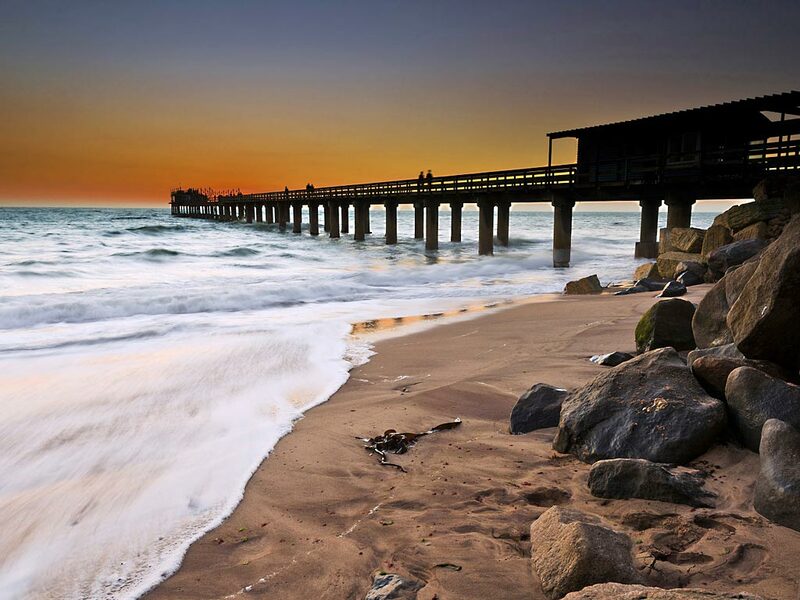 In the afternoon, you reach Swakopmund. On a city tour, you get to know this charming coastal town. You can spend the following day at your leisure: stroll through town or participate in one of the many activities (optional), such as boat tours or desert safaris tracking the Little Five. There are many restaurants in town you can choose from and give a try over dinner together with your fellow travellers (own expense). You spend two nights at the Organic Square Guesthouse. Along the coast, you make your way to the Zeila wreck this morning – one of the many shipwrecks at this stretch of Atlantic coast. After a photo stop, you leave the ocean behind, continuing inland. Your next destination: Spitzkoppe. Explore and experience these impressive and gigantic formations of granite rocks, covered in ancient rock art. Your journey now takes you to the foot of Hohenstein, the highest elevation in the Erongo Mountains. Here, you will spend the next two nights at Hohenstein Lodge. After your arrival at the lodge, you can explore the area on foot along one of the hiking trails or simply relax. Today, you visit the mineral miners at Hohenstein. You get an authentic insight in the life and work of the people who mine for aquamarine, tourmaline and other gemstones at the steep slopes, hoping for a precious find – often in vain. The beautiful landscapes of the area should not be forgotten; the first leg is driven by car before you get out of the vehicle and continue on foot through the so-called Boulder Forest with its giant granite rocks and rich vegetation until you reach the base camp of the ‘small miners’. The descend offers spectacular photo opportunities across the vast plains. If you’re not up for the hike, you can relax at the pool terrace. You spend another night at Hohenstein Lodge. Rise and shine; today starts early. Your guide takes you to the mighty Brandberg, at 2,580 metres the highest mountain range in the country. Your journey continues north-east, stopping at the Herero Craft Market along the way. Having excellent sewing skills, the women make pretty souvenirs. You are welcome to have a look around. Finally, you reach the picturesque Ugab Valley with its high terraces in the late afternoon. Visit Vingerklip, a curious rock formation resembling a finger, before you arrive at Vingerklip Lodge. After an early departure, you drive west to explore the Petrified Forest with its mineralised tree trunks, millions of years old. You also visit the UNESCO world heritage site Twyfelfontein with its numerous rock engravings and make a stop at the organ pipes, ancient basalt columns. Around lunchtime, you reach the Damara Living Museum. The Damara people are among the indigenous population of Namibia, who used to live as hunter-gatherers as well as off breeding cattle, sheep and goats. Today, much of their culture is unfortunately no longer part of the public’s memory. Look forward to learning about their ancient traditions and the culture of the Damara. Afterwards, you travel to the Grootberg Lodge, spectacularly situated on top of a high plateau. Enjoy the incredible views across the Klip River Valley. Accompanied by an experienced tracker, you search for the rare desert elephants. Experience an exciting safari through unique landscapes and find out more about flora and fauna of the Damaraland. With a little luck and patience, your tracker will find the comparably smaller desert elephants. Afterwards, you return to your lodge where you can spend the afternoon at your leisure. You spend another night at Grootberg Lodge. In the early morning, the rising sun colours your surroundings in its magical golden light. After breakfast, it’s time to head on. You make a quick shopping stop at Kamanjab before heading towards the more than 8,000 hectare-large Hobatere concession and lodge. 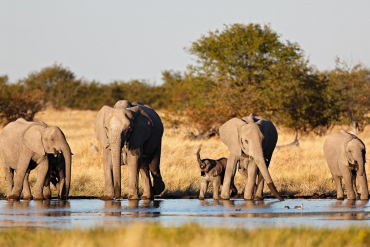 Bordering the western part of Etosha National Park, Hobatere is home to many wild animals. On a game drive in an open safari vehicle, look out for elephants, lions, zebras, giraffes, and different antelopes. You have dinner and spend the night at Hobatere Lodge. 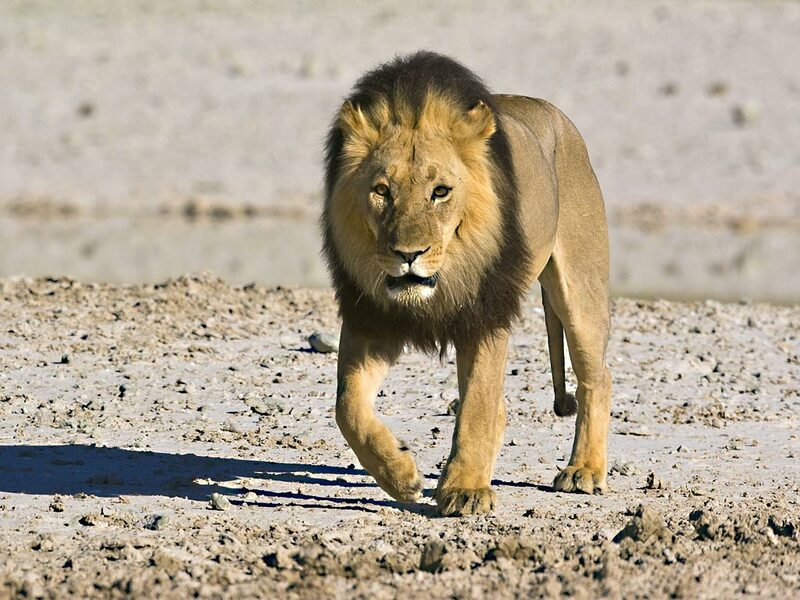 Your morning starts early as you enter the famous Etosha National Park today. It’s all about ‘safari’ in the coming days in one of Southern Africa’s most popular national parks. Slowly you make your way east. Along the way, stop to look for elephants, rhinos, giraffes, antelopes, lions, and leopards. Your guide will share their in-depth knowledge about the fascinating world of wildlife with you. You reach Okaukuejo Camp in the afternoon. Tonight, you enjoy a traditional braai – a BBQ – together with your guide. At the floodlit waterhole, you can watch wildlife throughout the night. If you’d like to observe nocturnal animals in the park, we recommend a guided night game drive (optional). Today starts with a hearty breakfast, followed by another game drive. No day on safari is the same so you can look forward to unique moments in nature. Herds of impalas, wildebeest, oryx, and zebras cross the salt pan, which stretches east for kilometres on end. Make a stop at some of the waterholes to watch animals drinking from up close. In the late afternoon, you leave Etosha National Park and after only a short drive, you reach Mushara Bush Camp, your home for the night. Many magical safari moments on your mind, you continue your journey south. On your way to the Waterberg Plateau, you stop at the Lake Otjikoto and also at the Hoba Meteorite. You can spot the Waterberg and its steep, red cliffs from afar. On a high plateau, at the slopes of this gigantic table mountain, is Waterberg Plateau Lodge. Enjoy incredible views across the seemingly endless bush savannah. In the afternoon, you can go on a hike, exploring the beautiful surroundings, or join a Rhino Drive (optional). You spend the night at Waterberg Plateau Lodge. After breakfast, you can hike up the plateau (optional) – your efforts will be rewarded with breathtakingly beautiful views! Your next destination is Okahandja. Here, you can stroll across the large souvenir market, browsing through hand-made wood carvings, basketwork or jewellery. In the course of the afternoon, you arrive at the charming Elegant Farmstead. Enjoy a delicious dinner, before your last night under the Namibian sky sets in. Today, you drive back to Windhoek, where your journey of discovery comes to an end. Your guide takes you either to the airport or an accommodation of your choice. It is time to say our goodbyes. Totsiens – until next time!